White Chocolate Blackberry Glazed Lemon Berliners - Chocolate Chocolate and More! White Chocolate Blackberry Glazed Lemon Berliners – light fluffy donuts topped with a sweet blackberry glaze and filled with lemon curd. Perfect for breakfast or afternoon coffee. With all the fresh strawberries around, I’ve been on a strawberry binge lately. Time for something new. I’ve never made donuts before so I thought I’d give them a try. I love lemon and Deiss sent me a lemon zester/cheese grater to try out. The first thing I noticed was the weight. 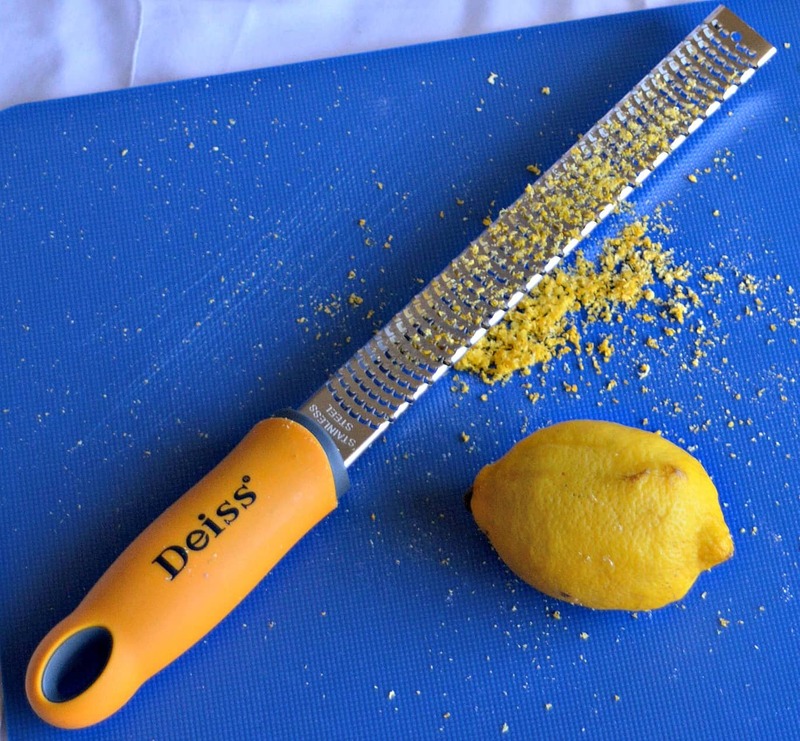 The Deiss lemon zester is one solid kitchen tool. It’s incredibly sharp so lemon zest comes off with just one swipe. The protective cover keeps you from cutting yourself when it’s not in use. I’m loving how easy it is to zest citrus and grate cheese. Deiss recommends freezing the cheese first so it doesn’t stick. That’s a handy trick I’d never tried and it works great (no pun intended). Now onto the donuts. I was actually looking to use my new donut pan but Joy of Cooking didn’t have any baked donut recipes. This recipe starts with potato roll dough. I added lemon zest to give the donuts more lemon flavor. You roll the dough and cut it like biscuit dough. Even though the disks are small, they expand a LOT when they rise and when you fry them. You make these like a sandwich. Brush the lower round with egg wash, put a spoonful of lemon curd in the middle, top with the other round and pinch the two together. I let mine rise for a second time. This dries out the dough a little so it doesn’t absorb the oil as much. This recipe makes about 30 Berliners. If you want more filling, you can use a large piping tip and poke a hole in the side to pipe in some more. I happened to have some frozen blackberries which go so well with lemon but you could use raspberries or flavor the glaze with more lemon zest. White Chocolate Blackberry Glazed Lemon Berliners are large donuts but it’s hard to stop at one. You can keep the unglazed ones in a sealed container for a few days but they’re best fresh. Heat buttermilk to 115°F. Add yeast and sugar and let sit 5 minutes. Mix mashed potatoes and butter together until thoroughly blended. Add buttermilk mixture and 2 eggs. Mix in 6 cups of flour and lemon zest. Then knead in the rest. Punch down dough and knead lightly. Divide dough in half. Roll out dough to ½ inch thickness. Cut into 2 ½ inch rounds with a biscuit cutter. Repeat with the other half of the dough. Whisk 1 egg together with water to make an egg wash.
Press the bottom round with the palm of your hand until it’s ¼ inch thick. Brush with egg wash and then place 1 teaspoon of lemon curd in the center. Press the top round flat with the palm of your hand. Place on top and pinch the edges together to seal in the lemon curd. Let rise 30 minutes uncovered. Heat cooking oil to 375°F. Slide donuts one at a time into the hot oil. Cook for 3 minutes per side or until golden brown. Put milk and cream into a microwave safe bowl. Heat on high for 1 minute. Add the white chocolate and let sit for a few minutes. Then stir to combine. Stir in the pureed blackberries. Let cool a little and then drizzle over the donuts. You’re a genius. Mashed potatoes and chocolate combination is weird but in a very tasty way. Thanks Jane. You can’t really taste the potatoes. They just give a little extra moisture and texture to the donuts. I hope you enjoy them!